Elisabeth Campbell (far left), Amanda Witherspoon (center) and Anna Gorma (right) discuss an inscription from the museum’s collection at a Museum Chat on February 1st, 2014. 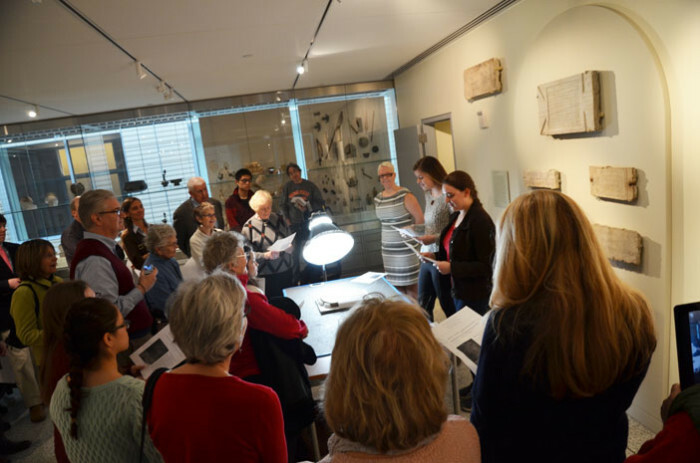 For a second year in a row, two Garrison Forest School students– Anna Gorman and Amanda Witherspoon– joined Elisabeth Campbell, graduate student in the Department of Classics, to study Latin funerary inscriptions in the museum’s collection. They translated a series of inscriptions, including an intriguing one that mentions a curse. You can read more about this inscription here. We asked both Anna and Amanda to think about their experiences working at the museum, and they sent us these reflections.